The Common Snipe is a bird of marshland. Its preferred spring and summer habitat is generally freshwater marsh and swamp, although you will also see them in wet meadows and on moorland. In winter, Snipe sometimes move down to saltwater marshes. 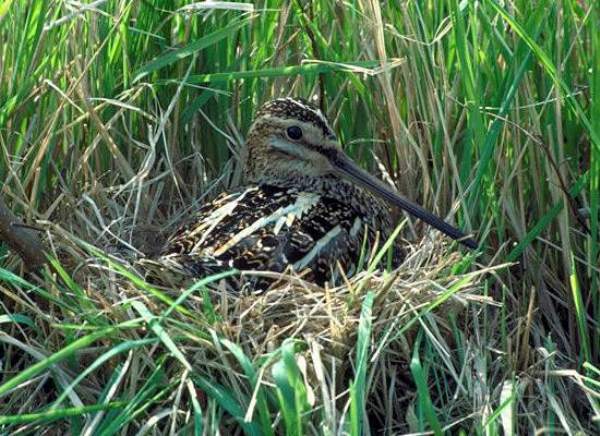 Snipe build their nests of grass on the ground, often concealing it in clumps of rushes. Even nests in the open are well protected from predators, because the eggs and the camouflage coloration of the sitting bird blend in well with their surroundings. With its long beak, the Snipe is well equipped for feeding on worms in muddy marshland. These resident waders also eat a variety of insects. In spring Common Snipe produce typically four young.